This review evaluates the effectiveness of a product called Marie Veronique Gentle Retinol Night Serum. This product is designed to reverse the signs of aging that come about from environmental and physiological stress. It contains ingredients that enhance collagen production in the skin so that it reduces wrinkles giving skin a younger and more radiant look. It also helps to reduce the appearance of blackheads and pimples from acne. The combination of vitamin A (retinol), vitamin C and vitamin E work very well together to stimulate the production of collagen. Collagen is a strong protein that is responsible for providing firmness in the skin. When more is produced by the skin cells, it physically fills up the space between the skin cells and plumps out the skin, like filling a balloon with water. The vitamins as well as resveratrol, superoxide dismutase and coenzyme Q10 are all antioxidants. This means that they take out all of the toxic chemicals that are responsible for causing damage to the skin and the formation of wrinkles earlier in life. Salicylate helps to reduce inflammation in the skin to avoid any negative reactions to the product. The ceramide has a similar effect to collagen. 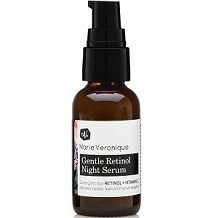 Marie Veronique Gentle Retinol Night Serum must be applied at night as the name suggests. The product has a pump cap so one or two pumps must be placed onto the customer’s hand and then applied to the face. The price of a 1 oz tube is $110. Customers in the United States of America receive free shipping for all orders that exceed $50, which includes this one. There are no signs of discounts for purchasing multiple units of this product at once or for subscribing for a regular order. This means that the price of this product is incredibly high. Each product from this manufacturer is covered by a 30-day guarantee. This means that if the customer does not see the results that they were hoping for then they can request their money back from manufacturer. It is always a good sign if a manufacturer offers a guarantee but we believe that 30 days is not long enough for the customer to try the product properly. This product is offered at a very high price, but it does contain a variety of high-quality ingredients. The manufacturer also expresses confidence in their product by backing it up with a guarantee, but this guarantee is not long enough to benefit the customer so it is problematic. It is also problematic that the manufacturer doesn’t offer any sort of discounts because it makes the use of this product far more expensive in the long term. There are some top quality manufacturers whose products are a bit pricier than most but many of these offer discounts when buying multiple products together. We suggest customers look at these manufacturers which have longer guarantees and offer discounts then.